How much better can it get?? 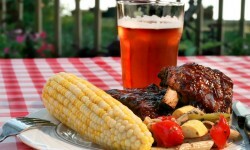 An outdoor, or indoor, event built around America's favorite comfort food BBQ! The road crew at BBQHWY® is building this section of the highway to guide you to some of the best BBQ cooked by some of Americas best cooks. You can find caterers for your events by city, state and zip and by their name. We'll help you find the people you need on the BBQHWY® as it winds across the United States. Tell Your Friends and Add Your Favorite Restaurants, Sauces and Caterers to the BBQHWY®!